Candidate probiotic bacteria were searched for use as probiotic against vibriosis in rainbow trout in this study. A total of 143 bacterial strains were isolated from rainbow trout rearing wa-ter, gills and skin mucus and tested for antagonistic activity against V. anguillarum. Antagonis-tic strains were characterized for enzymatic activity (protease, lipase) and hydrophobicity. Bac-teria belonging to the genus Aeromonas and Pseudomonas showed inhibitory activity against V. anguillarum. Aeromonas sp. HS23 showed protease and lipase activity, while Aeromonas sp. MS30 displayed only lipase activity. Pseudomonas spp. did not display enzymatic activity. On the other hand, all bacteria showed hydrophobicity indicating their adherence capability to the host. However, these strains should be further studied to explore their probiotic effects in vivo. Aquaculture has become an important eco-nomic activity in many countries. In large-scale production facilities, where aquatic animals are exposed to stressful conditions, problems related to diseases and deterioration of environmental conditions often occur and result in serious eco-nomic losses. Prevention and control of diseases have led during recent decades to a substantial increase in the use of veterinary medicines. How-ever, the utility of antimicrobial agents as a pre-ventive measure has been questioned, given ex-tensive documentation of the evolution of antimi-crobial resistance among pathogenic bacteria (Balcázar et al., 2006). Thus, the research into the use of probiotics for aquatic animals is increasing with the demand for environment-friendly sus-tainable aquaculture (Gatesoupe, 1999). The term probiotics is generally used to de-note bacteria that promote the health of other or-ganisms. Probiotics have multiple mechanisms of action to inhibit pathogens which include com-petitive exclusion, production of substances that inhibit growth of opportunistic pathogens (antag-onism), stimulation of the immune response, an-tiviral effects, increase of digestive function through production of enzymes, improved nutri-tion by providing essential nutrients, and im-proved water quality (Balcázar, 2002; Balcázar et al., 2006; Farzanfar, 2006). The antagonistic effect of probiotic bacteria against specific pathogens can be a method of se-lection. In vitro evaluation prior to in vivo testing was a good indicator of a probiotic effective at controlling bacterial fish diseases (Brunt & Aus-tin, 2005; Balcázar et al., 2006; Aly et al., 2008; Capkin and Altinok, 2009; Strom-Bestor and Wiklund 2011). Vibrio anguillarum as the causative agent of vibriosis isolated from a lot of marine fishes, mainly sea bream and sea bass (Çagirgan, 1993; Balebona et al., 1998). Recently, the diseases has been reported that it also caused important losses in rainbow trout (Oncorhynchus mykiss), cultured in freshwater in Turkey (Timur & Korun, 2004; Tanrikul, 2007). The aims of this study were to isolate probi-otic bacteria from indigenous and exogenous mi-cro biota of rainbow trout, screen all isolates in vitro antagonistic effects to V. anguillarum, and determine enzymatic activity and hydrophobicity of the isolates for the control of vibriosis. Bacteria were isolated from rearing water, gills and skin mucus of rainbow trout by spread plate method at 25 °C for 2 days. Representative colonies from these plates were subcultured onto fresh medium for purity, and identified by gram staining, catalase reaction, (3% H2O2), motility in TSB, oxsidase reaction, ability to metabolise glucose by oxidation and/or fermentation in OF basal medium supplemented with 1.5 % glucose and API 20 E rapid identification system (Bi-oMe´rieux SA, Marcy l’Etoile, France). All bacteria isolated from the samples were tested for antagonistic activity by a well diffusion agar assay (WDAA) against fish pathogen Vibrio anguillarum. Vibrio anguillarum was grown in 4mL TSB for 1 d at 25 °C, and 10 μL of each culture was mixed into 10 mL of melted TSA (43.5-44°C). After solidifying and drying for 15–20 minute, wells were punched (diameter = 3 mm) and 10 μL of 2 days old candidate probiont culture (approx. 108–109 CFU mL-1) grown in TSB at 25°C was added to wells in triplicates. Plates were incubated at 25°C for one day and observed for clearing zones around the wells. Strains causing clearing zones in the WDAA were tested once more in TSA to ensure that the antagonistic activity was stable after storage and sub-culture (Hjelm et al., 2004). Hydrophobicity test was conducted using Congo Red Stain (CRS) to determine the hydro-phobicity of the bacteria with petri plates pre-pared with Triptic Soy Agar with 0.03% Congo Red Sigma-Aldrich). Congo Red was added after sterilization of TSA. Each isolate was spread on plates by the cross-streak method and incubated at 30 °C for 24 h. Red colonies were considered positive (hydrophobic) and white or colorless colonies were considered negative (non-hydrophobic) (Sharma et al., 2006). Lipase and protease production of candidate probiotics were tested using tributyrin agar and skim milk agar, respectively. A clear zone sur-rounding the colonies indicated lipolytic and pro-teolytic activity. Antagonistic activities against Vibrio anguil-larum of 143 bacterial isolates were tested by the well diffusion agar assay. Aeromonas sp. HS23 isolated from rearing water of rainbow trout and Aeromonas sp. MS30, Pseudomonas sp. MS3 and Pseudomonas sp. MS16 isolated from skin mucus of rainbow trout displayed inhibition zones (12, 26, 17 and 12mm, respectively) against Vibrio anguillarum. These bacteria were also tested for enzymatic activity and hydropho-bicity. Aeromonas sp. HS23 showed protease and lipase activity. Aeromonas sp. MS30 displayed lipase activity. On the other hand, all bacteria displayed hydrophobicity that indicate their ad-herence capability to the host (Table 1). Phenotyp-ic characteristics of candidate probiotic bacteria were given in Table 2. In this study, Aeromonas sp. HS23, Aer-omonas sp. MS30, Pseudomonas sp. MS3 and Pseudomonas sp. MS16 showed inhibitory activi-ty against V. anguillarum. 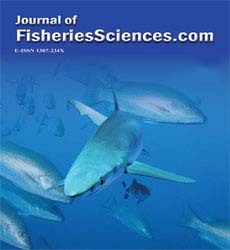 These results supports previous studies which demonstrated in vitro an-tagonism of antibacterial strain Pseudomonas fluorescens strain AH2 isolated from iced fresh-water fish (Lates niloticus) (Gram et al., 1999) and P. fluorescens and P. libaniensis isolated from rainbow trout (Spanggaard et al., 2001) against the fish-pathogenic bacterium Vibrio an-guillarum. Gibson (1999) also demonstrated Aer-omonas media displayed antagonistic activity against eight species of Vibrio. Likewise, Late-gan et al. (2006) reported the inhibitory activity of Aeromonas media in vitro against Vibrio an-guillarum. Aeromonas sp. HS23 showed protease and li-pase activity, while Aeromonas sp. MS30 dis-played lipase activity in the present study. Some authors claim that the production of extracellular enzymes such as proteases and lipases help the nutrition of the host (Balcázar et al., 2006; Far-zanfar, 2006), whereas others believe that the overproduction of these enzymes is a virulence factor, since pathogenic strains have high proteo-lytic, extracellular lipolytic activity (Quesada-Herrera et al., 2004). However, Leyva-Madrigal et al. (2011), selected lactic acid bacteria exhibit-ing extracellular enzymatic activity from shrimp gut for vivo experiment and noted this lactic acid bacteria mixtures have a beneficial effect against white spot syndrome virus (WSSV) in whiteleg shrimp (Litopenaeus vannamei). Adhesion to the intestinal mucosa is consid-ered an important selection criterion for persis-tent beneficial effects of probiotics (Ouwehand et al. 1999). When probiotic bacteria colonize the gastrointestinal tract for antagonism against path-ogens, modulation of the immune system, and healing of the damaged gastric mucosa, adhesion is recognized as an prerequisite (Rinkinen et al., 2000). The evaluation of probiotic adhesion may be performed by hydrophobicity test using congo red stain (Sharma et al., 2006; Leyva-Madrigal et al., 2011). A positive hydrophobicity result indi-cates that the bacteria have the ability to bind nonspecifically to the epithelium of intestine by hydrophobic interactions. In the absence of hy-drophobic molecules on the surface of the bacte-ria and the epithelium, they would repel, as both have negative charge (An and Friedman, 2000; Rinkinen, 2004; Leyva-Madrigal et al., 2011). In this study, all candidate probiotic bacteria were displayed hydrophobicity indicate their adher-ence capability to the host. However, there are no studies published on the adherence ability of the candidate probiotic bacteria belong to the genus Aeromonas and Pseudomonas. As a result of this study, we found candidate probiotic bacteria could be used in the control of vibriosis. However, these strains should be fur-ther studied to explore their probiotic effects on in vivo. Balcázar, J.L., (2002). Use of probiotics in aqua-culture: general aspects. In: de Blas, I. (Ed. ), 877–881, Memorias del Primer Congreso Iberoamericano Virtual de Acuicultura, Za-ragoza, Spain. Burbank, D.R., LaPatra, S.E., Fornshell, G., and Cain, K.D., (2012). Isolation of bacterial probiotic candidates from the gastrointesti-nal tract of rainbow trout, Oncorhynchus mykiss (Walbaum), and screening for inhibi-tory activity against Flavobacterium psy-chrophilum, Journal of Fish Diseases, 35(11): 809-816. Cagirgan, H., (1993). An investigation on the di-agnosis and the treatment of cultured sea bass and sea bream. Ph. D Thesis, Ege Uni-versity, Fisheries Faculty Turkey. Gram, L., Melchiorsen, J., Spanggaard, B., Hu-ber, I., Nielsen, T.F., (1999). Inhibition of Vibrio anguillarum by Pseudomonas fluo-rescens AH2, a possible probiotic treatment of fish, Applied and Environmental Micro-biology, 65: 969-973. Hjelm, M., Bergh, O., Riaza, A., Nielsen, J., Melcheiorsen, J., Jensen, S., Duncan, H., Ahrens, P., Birkbeck, H., Gram, L., (2004). Selection and Identification of Autochtho-nous Candidate Probiotic Bacteria from Turbot Larvae (Scophthalmus maximus) Rearing Units System, Journal of Applied Microbiology, 27: 360-371. Rinkinen, M., (2004). Methods for assessing the adhesion of probiotic and canine gut-derived lactic acid producing bacteria to the canine intestinal mucosa in vitro and measuring mucosal secretory IgA. Academic disserta-tion. Faculty of Veterinary Medicine, Uni-versity of Helsinki, 73 pp, Finland. Sharma, K.K., Soni, S.S., Meharchandani, S., (2002). Congo red dye agar test as an indica-tor test for detection of invasive bovine Escherichia coli, Veterinarski Arhiv, 76: 363-366. Tanrikul, T., (2007). Vibriosis as an epizootic disease of rainbow trout (Oncorhynchus mykiss) in Turkey, Pakistan Journal of Bio-logical Sciences, 10(10): 1733-1737. Timur, G., Korun, J., (2004). First Outbreak of Vibriosis in Farmed Rainbow Trout (On-corhynchus mykiss) in Turkey, Istanbul Uni-versity Journal of Aquatic Sciences, 18: 1-9.